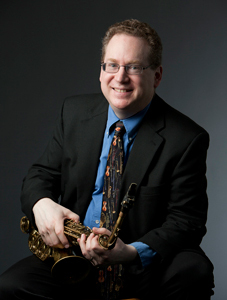 Saxophonist/composer/arranger Mike Titlebaum is Associate Professor of Music Performance and Director of Jazz Studies at Ithaca College, where he directs the Ithaca College Jazz Ensemble, coaches combos, teaches jazz saxophone and courses in jazz standards, arranging, repertoire and pedagogy. In 2010 he founded the Ithaca College Jazz Ensemble Composition Contest, which was endowed in 2017 with a gift by David P. ('60) and Susan W. Wohlhueter. Titlebaum also teachers and coordinates the jazz area in the IC Summer Music Academy. Titlebaum has delivered workshops, lectures and performances at numerous state and national conferences, including the Jazz Education Network, the International Society for Improvised Music, the New York State School Music Association, the New York State Band Directors Association and the Texas Music Educators Association. He has played in many of New York's world famous musical venues, including the Blue Note, Smalls, Augies, Fez Under Time Cafe and the infamous CBGB's as well as the pit orchestra of the Broadway musical "Cats." He has performed with the Rochester Philharmonic Orchestra, the Binghamton Philharmonic Orchestra, and with dozens of internationally recognized artists and groups such as Jason Robert Brown, Red Rodney, Randy Brecker, the Nelson Riddle Orchestra, the Mingus Big Band, Cab Calloway, Jeff Tyzik, Natalie Cole, Billy Taylor, Mel Torme, Manhattan Transfer, Branford Marsalis, Clark Terry, Lee Konitz, Kenny Wheeler, Billy Hart, Paquito D'Rivera, and many others. Titlebaum has published numerous compositions and arrangements through Lorenz (Heritage Jazz Works), Advance Music, and GIA Publications. Titlebaum was born and raised in Rochester, NY, where he earned his BM in Saxophone Performance from the Eastman School of Music in 1991, as well as the coveted Performer's Certificate in Saxophone. He received his MM in 1992 from Eastman in Jazz and Contemporary Media. He has studied with teachers such as Rayburn Wright, Ramon Ricker, Fred Sturm, Bill Dobbins, Russell Schmidt, Rich Thompson, Manny Albam, Samuel Adler, Al Regni, Elizabeth Marvin, and many others. As a student, he won nine "DeeBee" awards from DownBeat magazine in multiple categories, including Jazz Performance (on both saxophone and trumpet), Classical Performance, Jazz Arranging, and Jazz Composition. For up-to-date information on the jazz program at IC, please like the Facebook page Ithaca College Jazz. Questions about jazz studies at Ithaca College? Please see the Frequently Asked Questions page.